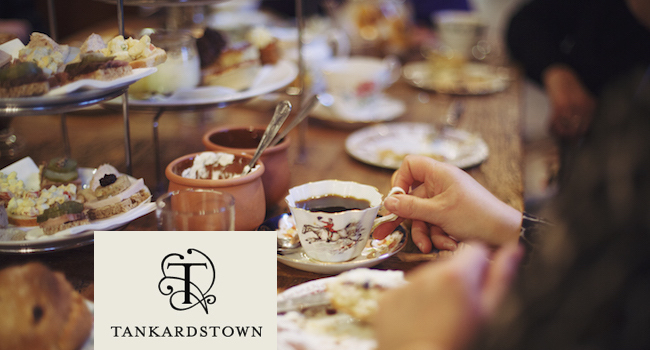 Take a trip to Tankardstown for their delightful Afternoon Tea. Observance of the custom of Afternoon Tea originated amongst the wealthy classes in England in the 1840’s. By the late 19th century, afternoon tea developed to its current form and was observed by both upper and middle classes and now in the 21st century has become very popular, particularly in Ireland. The only class we observe at Tankardstown is first class, and we do feel an entitlement to share our passion for Afternoon Tea with our guests, but ours is a more relaxed affair. The Tea Garden, is a quaint lopsided building which in fact was once a milking parlour, so no pomp and circumstance, but an invitation to partake in an old fashioned tradition in old fashioned surroundings with friends. Little cakes baked in readiness from our own bakery, Slane Bake are served with scones & sweet sticky jam, cream and a selection of seasonal open sandwiches all displayed on a tiered stand for you to enjoy, worthy of any nobility. Plus 2 glasses of Sparkling Prosecco. With Summer on our mind, Sparkling Afternoon Tea can be enjoyed on the West Facing Terrace when the weather is clement. Upgrade to Tattinger Afternoon Tea for 2 – Pay an extra €15 to Tankardstown on the day.